This is another retelling of the Arthur saga, and Ms Lackey has found a new angle: the way Guinevere experiences the history. One of the Gwenhyfars that is, because the idea upon which this novel is based, is Triad 56 of the Trioedd Ynys Prydein, that lists the ‘Three Great Queens’ of Arthur’s court. 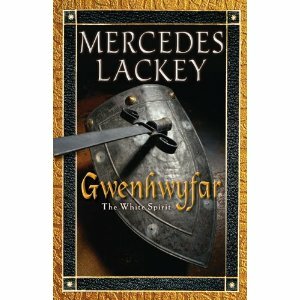 All of them by the name of Gwenhwyfar. And there’s supposed to be a fourth one, a ‘little Guinevere’ and she also is a character in this story. The setting is not so different from ‘Mists of Avalon’ by Marion Zimmer Bradley, friend and mentor of Mercedes Lackey. Arthur’s Britain is a realm on the verge of Paganism and Christianity. The Saxons form a constant threat. Arthur has united the Celtic tribes with the help of his companions, and of the Merlin. Main character Gwen is the third daughter of a Celtic king, drawn to her fathers beautiful warhorses and dreaming of becoming a warrior. In that she succeeds, but then the story takes another turn. I did not find the last part the best Mercedes Lackey ever has written, but the reason may be that I do not like the tragic ending of the Arthur story. And that is not something Ms Lackey could change. But like Marion Bradley, she has given a plausible story, and she had me enthralled while reading it. This angle is not entirely new. Some 20 years ago Persia Woolley wrote a trilogy about Guinevere ( http://en.wikipedia.org/wiki/Guinevere_trilogy ). It was translated in Dutch as well.